There are two types of ageing of the skin which leads to loose or lax skin: "true" ageing due to chronological age and , due to the toxic effects of cumulative sun exposure or other environmental toxins, such as smoking, pollution, and lack of circulating antioxidants (nutrition). The two types of ageing manifest themselves in slightly different ways. In true ageing, the skin produces less collagen and elastin and the fibril layers loosen and become less organised. 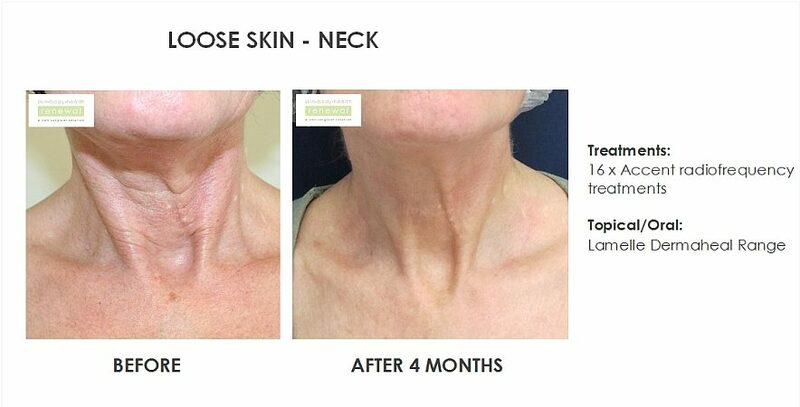 This causes the skin to sag and become thinner resulting in the classic signs of ageing. This process is accelerated by sun exposure or photo damage, making the skin older before its time. Another cause of loose body skin is having one or more children or sudden weight loss. In addition to topical therapies such as Dermaheal, our lax skin in office rejuvenation treatments such as Exilis Elite, TriPollar, Accent, Velashape, Titan Skin Tightening, Dermapen and Carboxytherapy offer a solution to those looking to restore a youthful appearance to their skin. If one can keep one's skin firm and taught with collagen, then the sagging that takes place over time can be contained as tighter skin supports the body .The new concept today is to start with rejuvenation treatments early so as to and avoid the inevitable ageing. At Body Renewal, a highly professional team led by a medical doctor assesses every patient and an appropriate combination treatment together with long term maintenance program is recommended. Every client is provided with a fully customised solution dependant on expectations, budget, time and medical conditions. To improve the penetration of topical cosmeceuticals such as Dermaheal, the Dermaroller™ Beauty Mouse is undoubtedly the most highly efficient device for transdermal delivery. The Beauty Mouse is gently rolled over the skin in a star like pattern after application of the topical cosmeceutical. It can be used daily without any harm to the skin. A typical half-life of the Beauty Mouse is 18 months. This device has been shown to increase epidermal absorption of topically applied products by over 200%. With normal topical applications, NOT more than 0.3% of liposomes can penetrate the skin surface. With the Beauty Mouse up to 40 % increased penetration of liposomes is achieved. Cellulite topical therapies also achieve more effective penetration with the Beauty mouse. Melissa is nothing short of brilliant! She is extremely professional and works quickly and (relatively) painlessly while at the same time being so friendly and chatty that the treatment passes in a flash. I would really recommend Melissa to anyone looking to endure the torture of Carboxy. Overall, the staff at Skin Renewal Cape Quarter were all lovely, very helpful and welcoming. The treatment and service is very professional. The staff is very friendly, helpful and knowledgeable. I would highly recommend this clinic to other people. Review -I love my i-lipo treatments! My therapist is always friendly and has a smile on her face. I love my i-lipo arm treatments and will definitely come back for more. I recommend the Stellenbosch branch to everyone who wants to receive great service! The therapist must be commended for her professional approach and passion for her job. She communicates consistently throughout her treatments advising of the process which makes me feel comfortable. She has incredible people skills and is a real asset to the skin Renewal team. I have seen great results from my treatment. Review -Great service with good advice! I have had great service, with good advice and direction. Liezel gives excellent suggestions for future treatments and my results have been just what I was looking for. Dr Lestonn's script also put me into the treatment package I could afford, with the best results. Review -The Best I have ever experienced! Review -Always good fun to spend time with Liezel! Cheray< has always been a pleasure to deal with always accommodating and very informative of all products available old and new. Review -Always a treat to visit the Irene Branch. I returned to the Irene branch after having my Rosacea treated previously, with abdominal skin left after two pregnancies. I was left in the very capable hands of Ilona Swart and after 3 treatments, I can already see a difference. Always a treat to visit the Irene branch, such a jovial spirit there.